Part of the Paxiom Group, EndFlex specializes in creating packaging solutions for erecting, forming, sealing, and packing cases, trays, boxes, and other types of containers. For our tray erecting solutions, we have engineered four products. 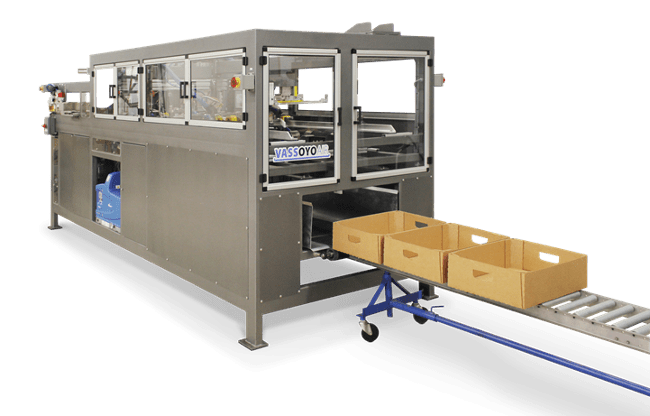 Designed to withstand even the most demanding production needs, the Vassoyo Mechanical Tray Erector is an automatic tray former that erects various sizes and configurations of trays with the use of hot-melt glue. It operates on different tray styles such as side and end slotted, one and two-piece telescope style trays, and design style containers with a cover. Commonly used for industries including toys, gaming, auto parts, hardware as well as consumer goods and food products, this tray erecting machine gently handles tray material preserving high-gloss graphic content and aesthetics needed for the retail type of production. Available in two models, Vassoyo 3029 & VAssoyo 3934, both have a maximum mechanical rating of up to 40 trays per minute. The VassoyoAir Breaker Box is an automatic tray former that erects Breaker and Column Case style trays in either L-corner or triangle corner posts configurations. With this tray erecting machine, tray blanks are pulled down individually using vacuum cup technology. The corner posts of the tray are then folded and glued down. After which, the tray is compressed while waiting for the next one to enter the forming section. Once a new tray arrives, the formed tray will be then be discharged from the machine. The Break Box Tray is most commonly used for industries like meat, seafood, poultry, and beverage. Next is the VassoyoAir Triangular Corner Post Tray. Another automatic tray former that erects trays but this time in triangle corner post configurations. Like the Vassoyo tray former, this is designed to pull tray blanks, fold and glue corner posts and major flaps. Then finally discharge the finished tray from the machine. Applicable tray styles include RSC style flaps or no flaps creating a retail-ready tray with a display window. This particular tray erecting machine of ours normally serves industries like meat, poultry, confectionery, snacks, beverage, consumer goods, and several club store displays. Finally, we have the PopLok Tray Erector designed specifically for fold and truck trays. This tray erecting machine takes a blank one at a time. It then pulls it through forming plows, erects the side and end panels all the while folding the minor flaps. Once the tray goes to the bottom part of the vertical travel, the roll-over flap will be folded and locked in place. The finished tray will then exit the machine. All of our tray erecting machines under the Vassoyo brand have the same standard features. These include a color touchscreen, easy load blank magazine, Nordson Glue System, interlocked doors, NEMA 4 Enclosures, and SMC pneumatic components. The PopLok Tray Erector shares the same standard features as the Vassoyo brand. However, instead of having an easy load blank magazine, the PopLok has a no-mandel required feature.